"Your Special Day, Your Way"
Offering a bespoke service for all of your wedding, special occasion and corporate party needs, you can rest assured that you'll receive a stellar service from one of the most experienced DJs in the industry. Music from the 50s through to the latest chart hits, professional quality sound and lighting gear, exceptional customer service and a wide range of optional extras such as mood lighting, live singing and guitar sets, monogram gobo projection and much more means Scotland's Party DJ should be your one stop shop for all of your music and entertainment needs. Required by many venues, Jim Moore - Scotland&apos;s Party DJ has a current PLI policy with AMP DJ in the amount of £10 million. Also required by many venues, Jim Moore - Scotland&apos;s Party DJ has supplied satisfactory evidence of holding current PAT inspections of their equipment dated within the last 12 months. A Method Statement outlining Jim Moore - Scotland&apos;s Party DJ&apos;s Health & Safety procedure for setting up disco equipment has been provided. Jim Moore - Scotland&apos;s Party DJ has provided Risk Assessments undertaken at events sourced via needadisco.com, indicating that they can undertake these competently. Why do people choose to book Jim Moore - Scotland&apos;s Party DJ? Experience of dj. What was included in price. Sounds the best for my occasion. "Jim was everything we had hoped he would be, and everything his reviews said he wound be - absolutely fantastic. There is not a single thing I would change about the service. I couldn't recommend Jim highly enough. His video compilation was with us a few hours after the event and it captured the mood of the night perfectly. 10/10"
"Thanks for the lovely feedback. It's always great to know that I've managed to exceed people's expectations." "Absolutely fantastic service provide by Jim. A true professional nothing was too much to ask and he is a very polite well balanced bloke who can conduct himself accordingly. Jim offered some sound advice (pun intended) and interacted well with guests on the night. Jim is definitely not the cheapest guy out there to provide this service but I truly believe you get what you pay for and in this case the additional costs were easily justifiable. Always quick to reply and easy to communicate with and very well presented Jim is a likeable guy who is great at what he dose we can not thank him enough." "Thanks for the kind words, it was a pleasure to play a small part in your big day." "Jim was amazing. I changed my 50th to a double party as was our wedding reception also. Jim did this with no fuss and was in contact abt everything. From having a great selection of music for all ages to calming me down when i was stressed abt it all. He is very friendly and approachable, and liasoned with me throughout the evening. Whenever someone i no is looking for a DJ, i would recommend jim without a doubt. " "Thanks for your kind words. It was a pleasure to be part of your wedding." "Jim was great. Played all requests and lighting and sound fab! Would definitely use again if occasion arose!" "Thanks for the kind words. It was a pleasure and you and your guests were brilliant to work with." "Jim was a really nice guy, pleasant helpful and most importantly everyone thoroughly enjoyed the evening." "Thank you, it was my pleasure." "Great party and very good with the kids." "Thanks for the comment. It was a great party and the kids are a credit to the school." "Jim was brilliant with the kids and was great at playing all the requests they wanted. My son had an amazing day thanks to jim :)"
"Thanks for the kind words. It was a pleasure to play for your sons birthday." Jim Moore - Scotland&apos;s Party DJ also offers a range of additional party services not directly linked to musical entertainment. 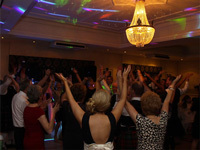 Get FREE no-obligation disco quotes from Jim Moore - Scotland&apos;s Party DJ and other DJs covering your venue. Take 2 minutes to fill in some basic details and we'll do the rest! If you are contacting Jim Moore - Scotland&apos;s Party DJ about an event, it's always a good idea to include the DATE, LOCATION, EVENT TYPE, AGE GROUP and TIMINGS to speed things up!